The courses listed below are instructor-led classroom format conducted at the Coastal Regional Commission of Georgia in Darien, Georgia. We also conduct instructor-led online training via WebEx, and remote training at the client location upon request. 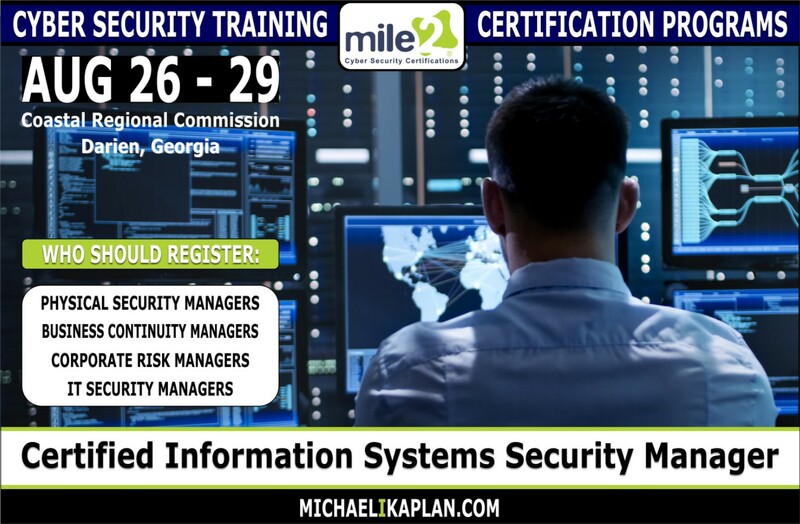 To discuss these options, or to find out about customized training solutions tailored specifically to your needs, please contact Michael Kaplan via email at michael@michaelikaplan.com. Disaster recovery and business continuity planning is the process of having a professional work with a business to prepare processes, policies, and procedures to follow in case of a disruption. The comprehensive Mile2 Certified Disaster Recovery Engineer certification course goes beyond traditional BCP training - preparing students for industry certification in Business Continuity planning and presenting the latest methodologies and best practices for real-world systems recovery. 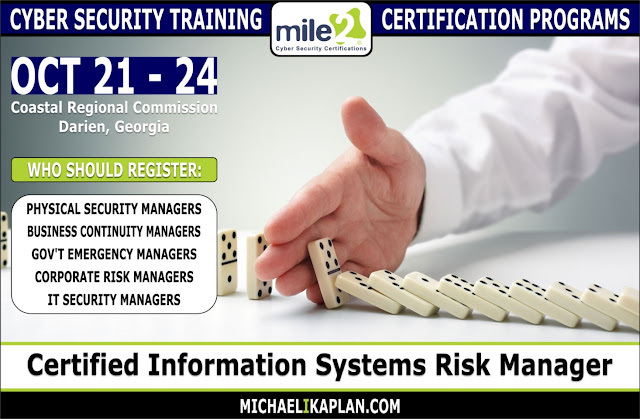 Students will receive a solid foundation of instruction that will enable them to create meaningful business continuity plans. The Mile2 Certified Information Systems Risk Manager certification course is designed for Information Technology and Information Security professionals involved with risk identification, assessment and evaluation, risk response, risk monitoring, IS control design and implementation, monitoring and maintenance. Students will receive comprehensive training built around 5 core competencies: Risk Identification Assessment and Evaluation, Risk Response, Risk Monitoring, IS Control Design, Implementation, and Control Monitoring / Maintenance. 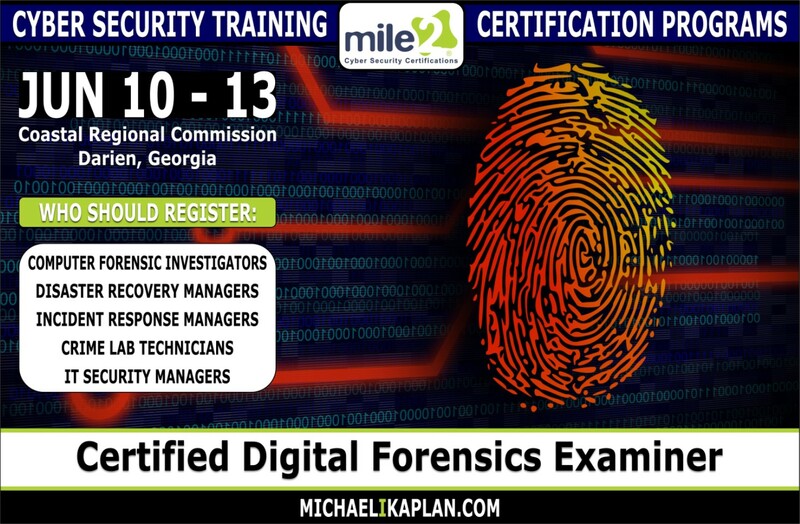 The Mile2 Certified Digital Forensics Examiner vendor-neutral certification course trains Cyber Crime and Fraud Investigator students using electronic discovery and advanced investigation techniques. This course is essential to anyone encountering digital evidence while conducting an investigation. Students will learn methodologies to implement forensically sound investigative techniques to evaluate scenes, collect and document all relevant information, interview appropriate personnel, maintain chain-of-custody, and write a findings report. 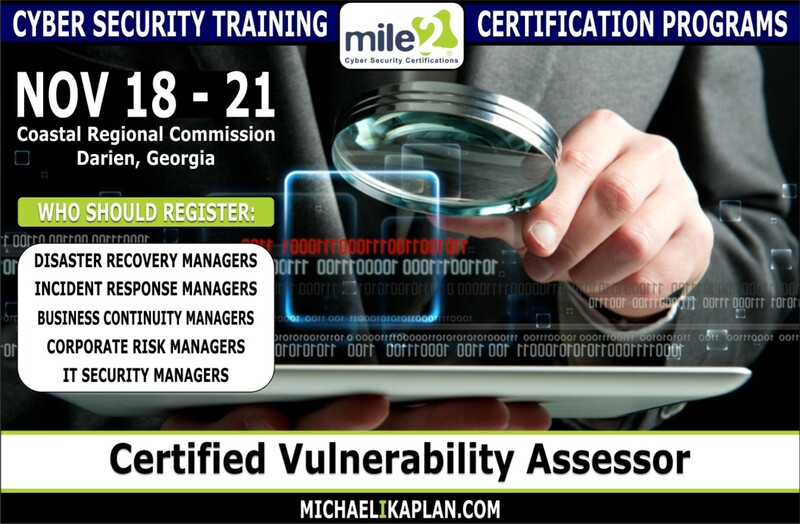 The Mile2 vendor-neutral Certified Vulnerability Assessor certification course provides foundational knowledge of general VA tools as well as popular exploits with which an IT engineer should be familiar. This course is a fundamental cyber security certification course that focuses on vulnerability assessments. The student will be versed with basic malware and viruses and how they can infiltrate an organizations network. The student will also learn how to assess a company’s security posture and perform a basic vulnerability test to help secure the organization’s networking infrastructure. The Mile2 Certified Information Systems Security Manager certification course covers the skills and knowledge to assess and analyze threats and risks posed to modern information systems. Topics covered in this course will include risk and incident management, security programs and CISO roles, Information Systems security strategy and frameworks, audit and risk management policy development, compliance and awareness. 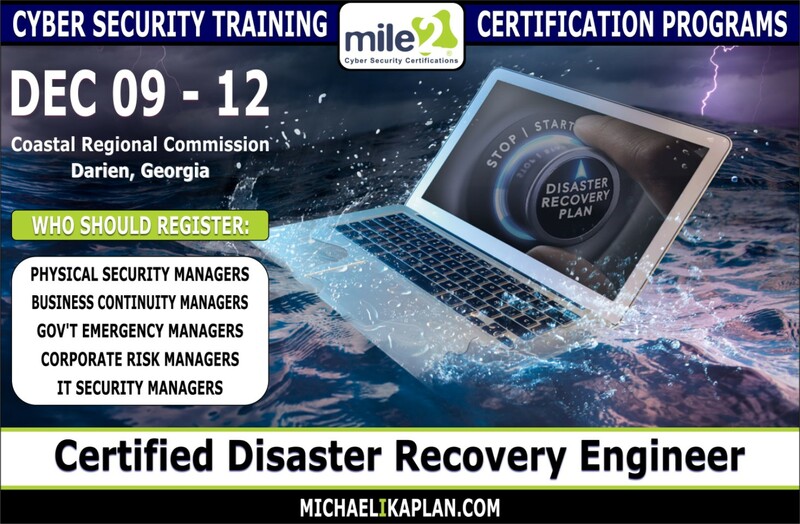 Students will also be prepared to address development, deployment, and maintenance of comprehensive disaster recovery and business continuity planning.